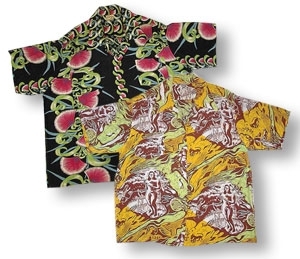 Because our site is very frequently used by journalists from broadcast and print media for research information on the history of the Hawaiian shirt and culture, we present two of the best aricles wriiten on the subject. Not even tucked in, blazing and bold, here's the aloha shirt! The missionaries might have denounced extravagance and nakedness, the craving for vivid colors, tropical textures, and sensual shapes couldn't be suppressed. Within two centuries a modest workman's shirt grew into the trademark wear of Hawaii. But the history of this shirt reflects the growing pains of a nation and the true Hawaiian aloha shirt has become increasingly hard to find. In the late 1920's and early 1930's tourists, always looking for exotic souvenirs, fell for a fad of the young islanders, unusual prints. Artists and tailors spotted a serious business. The name "aloha shirt", registered in 1936, soon labeled a flourishing industry. Paintings of famous artists were transferred to the fabric of choice, rayon, silkier than silk and inexpensive. Designs competed in intricacy. Border shirts, picture shirts, patterned shirts. How many ways to say Hawaii? Labels themselves became works of art, reflecting inspiration and wild dreams of success. After the darkness of the second World War, colorful, exotic prints were more than ever what visitors wanted. Add to this the attention Hawaii received in the 1950's when it competed with Alaska to become the 49th state, as well as the intrigue with Hollywood. Aloha shirts became a craze. Elvis Presley, John Wayne, Frank Sinatra, all going Hawaiian. Montgomery Clift, dead in a ditch in "From Here to Eternity," in Hawaiian print. Immortal, from now on. Endorsements by world-famous gold-medal swimmer and master surfer Duke Kahanamoku. Photographs of presidents. Kamehameha Garment Company, one of the largest pioneer manufacturers, shipped 35 tons of garments to the mainland in 1960. "Made in Hawaii" sells! "Spiritually destructive," said a Japanese boss in 1955. "Truth is" writes Honolulu Magazine, in 1967, "almost no man past 30 really looks good in an aloha shirt." Questionable as this might be, with the large demand on the mainland came the need for more effective production. First factories took over. Then labor and designers overseas. On the mainland, imitation shirts appeared. Designs lost their artistic quality. Matching his and hers, no inspiration. Demand lowered, prices dropped. The shirt became "tacky". Only one company in the whole state of Hawaii decided to stay true to the original Hawaiian shirt. Reyn Spooner, created in 1956, is the only aloha shirt line designed and produced right here in Hawaii, its prints still pulsating with local strength. Otherwise weakened, the Hawaiian shirt lost uniqueness. Yet the greatest loss is that no one thought of keeping track. Numerous designs have vanished in the cotton clouds of history. Original shirts with original labels have become collectors items worth hundreds and even thousands of dollars. The true Hawaiian shirt reads like a painting of paradise. The fabric is a canvas for the rich images of the islands. And aloha shirts, true or not, are here to stay. Still the greatest souvenir. They will forever mirror what Hawaii is about. The challenge is now to find the real one, the one that shows aloha. Reprinted from the Aloha Shirt Book Dale Hope and Gregory Tozian are the authors of The Aloha Shirt Book. Dale Hope is also president of Kahala Sportswear.